I believe that deja vu is a real thing. Somehow we see fragments of the future in our minds, and even though those fragments don’t always consciously stay with us we remember them when the event comes to pass. Perhaps it’s a way that God reminds us how He is in control of everything, and that He guides your path. This entry was posted in Uncategorized and tagged deja vu, god, thoughts on October 13, 2014 by valcaraz. It is commonly misconceived that hatred is the opposite of love. This is simply not true. Love is caring about someone or something, caring so much that you would do anything to spend your life with someone, caring enough to follow a passion, a career. What I’ve found is that if I’ve fallen in love with someone, the only way to get over them is to stop caring. Stop investing time In wondering how their life is, what they are doing, and who they’re with. If love is caring, then the opposite of love is apathy – not caring. This entry was posted in Uncategorized and tagged apathy, hate, love, thoughts on October 12, 2014 by valcaraz. First off, I’m a bit disappointed in the regeneration to 12. With all the emotional and musical buildup, they needed to go hard on the pain of losing Matt Smith. Instead they paused, snapped his neck and BOOM Capaldi. Oh well. Overall, though, pleased with what they did in both the 50th and the Christmas specials. Always a pleasure to see Tenant as the Doctor. And Rose Tyler played in pretty well. It’s amazing how much changed in 11’s time. The show went from campy to epic in about 2 seasons. Fantastic production for BBC, definitely an improvement. On a closing note, I look forward now to seeing Capaldi as the Doctor. Can’t wait for August! This entry was posted in Uncategorized and tagged day of the doctor, doctor who, review, thoughts, time of the doctor on June 1, 2014 by valcaraz. 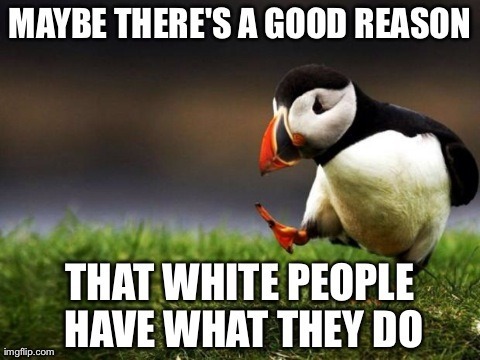 Hmmm, are you trying to say white people deserve to be privileged? If that’s the case there are many holes in that argument. First, many scientific advancement come from many parts of the world, some from the egyptians, others from China, others from England, others from India„ others from the Greeks and Romans… etc. Each civilization has done something important other has not, and our modern advances wouldn’t be possible by only one “race”. Also as a Christians, I believe all wisdom comes from God himself, as such no one has an exclusive right of knowledge. If one nation has it, it’s their duty to share it with the rest of the worl and use it for good. In the past, the Babylonians, the Persians, the Chinese, the Egyptians andother non-white civilizations were blessed by God with great power and wisdom. Now, many first world countries are white countries. God has blessed them, and as such have the duty to use those blessings to help others. The fact that they are blessed doesn’t make them special. That’s not entirely my point. More accurately, I think “white people” receive so much hate and animosity from all angles (keeping in mind that I look at U.S. culture. And the Internet). People complain about how white people control so much, yet they can’t seem to find representatives of their own qualified enough to take leadership. In my mind, if a group of people dislikes the leadership of another group, they need to do something in their own ranks instead of hating on the other. What really sickens me is white people who apologize for being white. Why? Because they didn’t enslave anyone! They probably didn’t murder anyone! They may only be guilty of low levels of bullying, but they have no reason to apologize because of the color of their skin. If you replaced all the references to white people in propaganda with references to other ‘races’, women, or different sexual orientations, those thoughts or writings would no longer be acceptable. The principle of the thing and the hypocrisy drive me up the wall. Because I’m a white person who has been blessed with many things – height, intelligence, good parents, etc…, and these people attack me and others like me for just being who I am. Sound familiar? As Christians, sharing is what we are called to do. Unfortunately, the world becomes less Christian by the day. All we can truly do lies at the individual level, but in a perfect world everything would be shared justly and willingly (without government intervention – that’s evil). But for the time being, this world is not perfect. This entry was posted in Uncategorized and tagged thoughts on May 23, 2014 by valcaraz. I’ve been trying not to swear as much when I write here. A couple months ago I kinda just stopped using those types of words, though I still reblog them. It’s hard to hold back though when I’m sitting here talking about math and stuffs. I suppose it’s worth it, but it’s annoying. This entry was posted in Uncategorized and tagged but it is not this day, maybe one day I will, random, sometimes I want to explode into cursing, swearing, thoughts, tumblr on January 21, 2014 by valcaraz. You can’t wait to get to Heaven and see if Joan of Arc was a messenger of God or possessed by Satan. This entry was posted in Uncategorized and tagged joan of arc, thoughts on January 2, 2014 by valcaraz.